Maybe the mint chip will prevent the flu? Frosty the Snowman (M.D.) is giving them out and he has to stay in the freezer while he's doing it or he'll melt. Also NOBODY touch his old silk hat. This brings to mind the Bill Cosby routine about getting his tonsils removed as a kid: "ICE cream...we're gonna get ICE cream!" 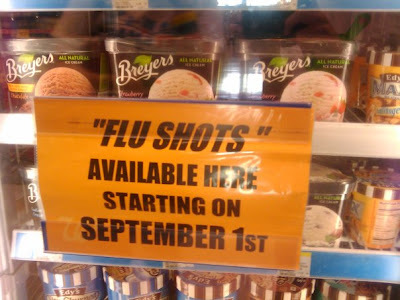 Hey, maybe "flu shots" is code for "tonsils removed." @Kirsten, yeah because everyone knows kids will be less fearful if you're telling them they're gonna get a flu shot.